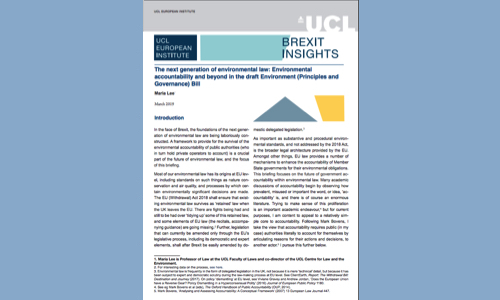 In the face of Brexit, the foundations of the next generation of environmental law are being laboriously constructed. A framework to provide for the survival of the environmental accountability of public authorities (who in turn hold private operators to account) is a crucial part of the future of environmental law, and the focus of this briefing. EU law provides a number of mechanisms to enhance the accountability of Member State governments for their environmental obligations. This briefing focuses on the future of government accountability within environmental law. This is a UCL European Institute Brexit Insights Paper.